The future ... Mankind has depleted the Earth's resources. Now, unexplained earthquakes, volcanoes and tidal waves wreak havoc on the planet. In the wake of this destruction, strange metal plates erupt from the Earth's crust. From these large disks emerge organic machines called Antibodies. Yuu Isami pilots an Antibody called a Grand Cher. 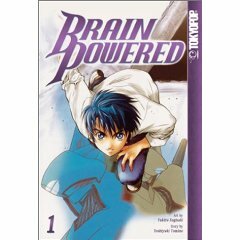 Hime Utsumiya is the unlikely pilot of an Antibody called a Brain Powered. Yuu works for Orphan, a mysterious and sinister group of scientists who dwell in an ancient alien vessel that lies at the bottom of the sea. Hime's not a big fan of Orphan. When the two cross paths, their fates are bound to change ... and so will that of the entire world.